A bed cover to ease anxiety and help you feel better? A weighted blanket has been proven to be beneficial for sleepers. Most of the talk about sleeping centers around what one sleeps on, not under. It turns out the two should be discussed in harmony. To fall asleep on and under the right conditions will make you a dreamy blanket sandwich. A weighted blanket will help with this. The weight of the blanket acts as deep touch therapy. The bed cover is often filled with plastic poly pellets that are sewn into compartments, distributing the weight properly. Through the deep pressure touch of a weighted blanket, receptors become stimulated similar to swaddling an infant. This helps the body to relax, feel more grounded and safe. Clinical studies suggest that when these pressure points are triggered, the brain releases serotonin, a neurotransmitter that is known as “the calming chemical.” It also has other useful benefits, such as maintaining memory. Some people buy supplements for serotonin, so the blanket is like a pill bottle, and you are the pill, at no additional cost. 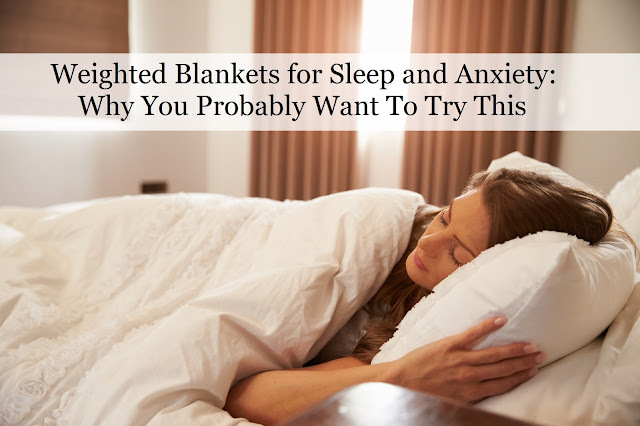 An array of conditions can be helped by a weighted blanket such as Parkinson’s disease, Alzheimer’s disease, Tourette’s syndrome, bipolar neurological problems, PTSD, ADHD, cerebral palsy, sleep disorders, autism, menopause and practically any type of anxiety. The alleviation of anxiety also helps with depression, trauma, paranoia, detoxification and so on. This covers a broad spectrum, which is why the weighted blanket trend is picking up steam. with anxiety. A study published in Australasian Psychiatry (2012) confirmed this. In 2014, findings appeared in the journal Pediatrics. 63 children – ages 5 to 16 – slept with either a weighted blanket or a non-weighted, look-alike blanket for 12 to 16 weeks. After this first phase, the two groups switched blankets and used the other blanket for approximately two weeks. It showed that sleep did not improve significantly for either group. However, most of the children and parents reported preferring the weighted blanket. The weight of the blanket for adults should be around 15 to 30 pounds. Seeking the guidance of a doctor or occupational therapist is a good idea. Those suffering from respiratory, circulatory and other conditions should not use a weighted blanket. Here is an excellent tutorial video. There are others, so search around! In regards to sleep and sleep systems, no discussion would be complete without a mention of “grounding” or “earthing” the other natural way to improved sleep and anxiety. Let’s say you decide to use a weighted blanket, well it would make sense to do the weighted blanket on top and then the grounded bed or sheet on the bottom. Over a dozen peer-reviewed studies have been conducted on “grounding” or “earthing” over the last ten years. These studies indicate that over time, grounding normalizes cortisol, reduces inflammation, calms left brain activity, improves muscle soreness recovery, and helps protect the body from electromagnetic (EMF) pollution especially in the low Hertz range. David Wolfe discusses the science behind grounding in the following videos.